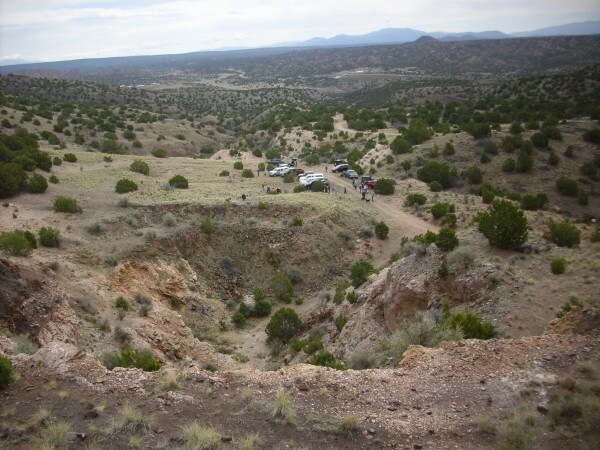 This was my first trip with the Los Alamos Geological Society. I have known about the Society for some years, having attended several of their annual Earth Treasures shows and having the temerity to link some of my blog posts at their Facebook page, but I didn’t actually pay the dues and join until last December. The Joseph Mine (map) is located just a couple of miles north of the small resort of Ojo Caliente (map). I’ve been to the area before, where I found that there are some excellent hiking trails, but I have not attempted to drive into the back country. The hilly terrain north and west of the resort is the southernmost part of the Tusas Mountains and is underlain mostly by Precambrian metarhyolite, amphibolite, and schist, intruded in numerous locations by pegmatite dikes. The Joseph Mine itself is located in a large pegmatite plug that has intruded the boundary between metarhyolite and amphibolite outcrops. 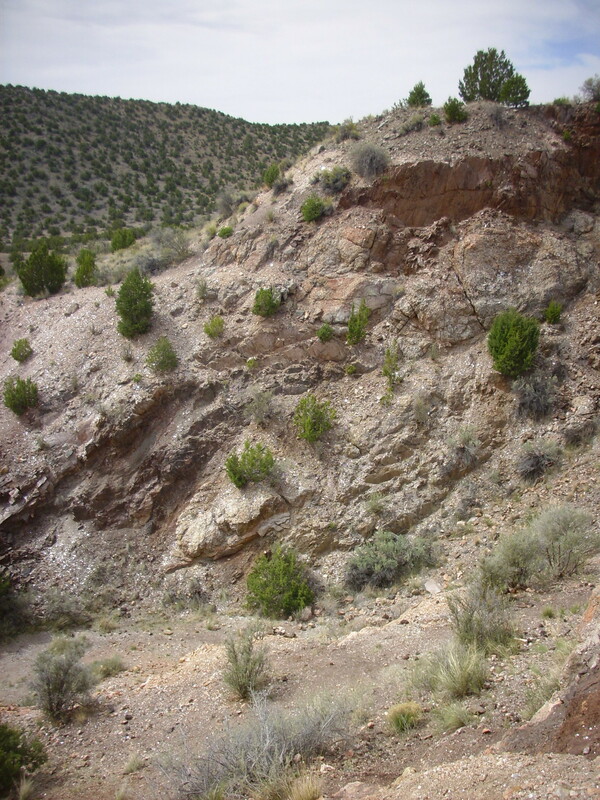 The Tusas Mountains are part of the Yavapai Precambrian province, which is about 1.7 to 1.8 billion years old. At that time, the southern boundary of the tectonic core of North America, which geologists have dubbed Laurentia, ran roughly along the Wyoming-Colorado border. 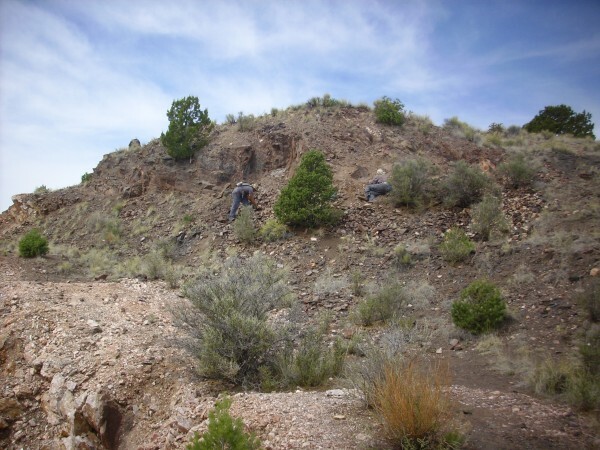 South of this ancient shoreline, there was a mid-ocean ridge, and a hodgepodge of island arcs and other juvenile crust was accreted to southern Laurentia to form the Yavapai Province. This extends from northern Colorado to the Jemez Mountains, west into Arizona, and east perhaps as far as the Midwest. 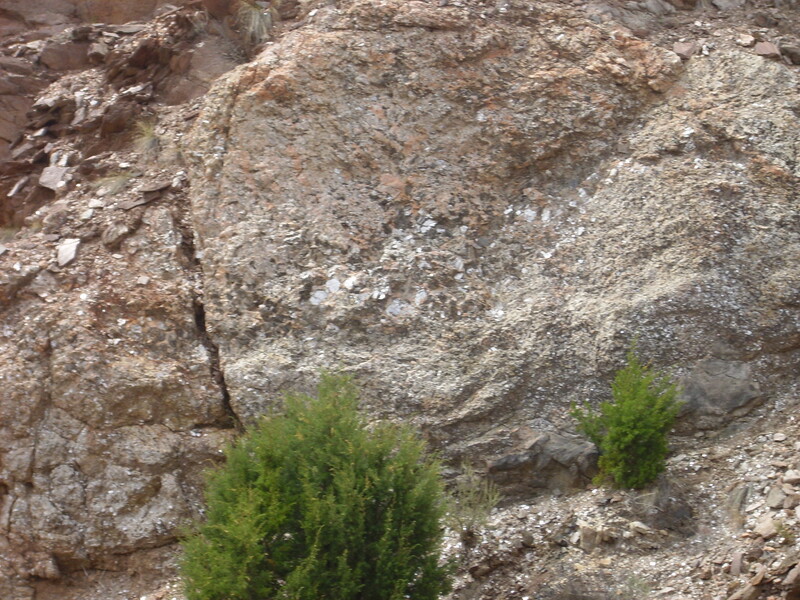 The metarhyolite and amphibolite surrounding the Joseph Mine have been assigned to the Vadito Group, and radioisotope dating of zircons from these formations confirms an age of about 1.7 billion years old. The pegmatite intrusions into the Vadito Group, including the plug in which the Joseph Mine is located, have been dated to about 1.4 billion years old. 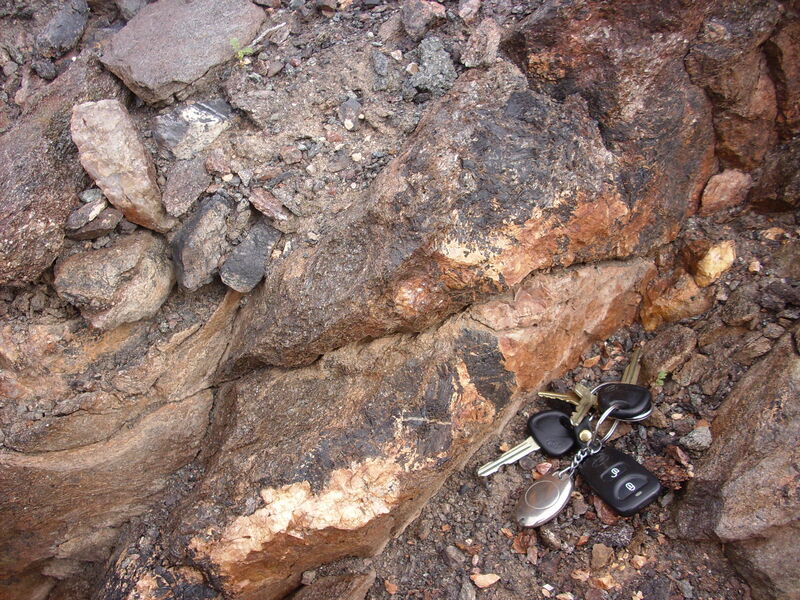 Similar granite intrusions of this age are found throughout the western United States, making up perhaps as much as 40% of Precambrian exposures. The cause of this episode of widespread intrusion of high-silica magma into the crust remains controversial. The most common opinion is that it did not result from a continental collision or other mountain-building event, and so these granites are described as anorogenic (not associated with an orogeny, or episode of mountain building), or A-type granites for short. A-type granites have a distinctive chemical composition, being rich in silica and alkaline metals (sodium and potassium) and having a high ratio of iron to magnesium and a low calcium content. However, a few geologists claim that they have found evidence for an orogeny at about this time in the Picuris Mountains, and it is not obvious what other event could have caused such widespread crustal heating. So geologists have hedged their bets: A-type can also stand for alkaline-type, without any judgment on its mode of origin. 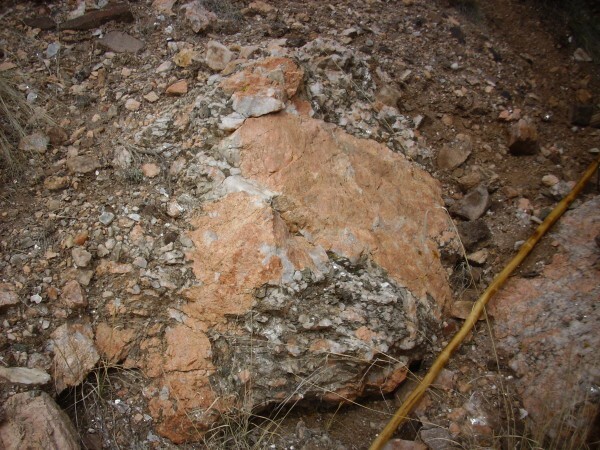 The A-type pegmatites of the Tusas Mountains are also rich in aluminum, and the combination of high aluminum and potassium content is favorable for forming muscovite (potassium mica). Mica has been extensively mined from the Tusas Mountains and was the principal product of the Joseph Mine. Some of the mica here was truly spectacular, forming “books” (individual crystals) exceeding three feet in diameter. Even today, it is easy to find mica books six inches across, as we’ll see in a moment. 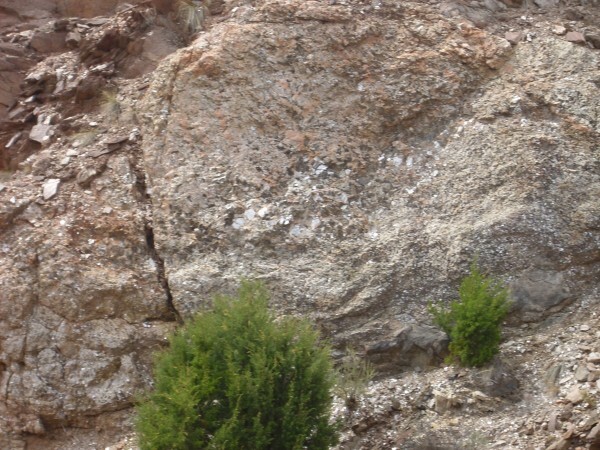 Pegmatites are thought to form from the very last part of a granitic magma chamber to crystallize, and so they tend to contain unusual minerals containing incompatible elements. Incompatible elements are elements having a combination of ionic radius and electrical charge that is significantly different from those of the more common rock-forming elements. As a result, these elements are reluctant to enter ordinary rock-forming minerals as a trace constituent. 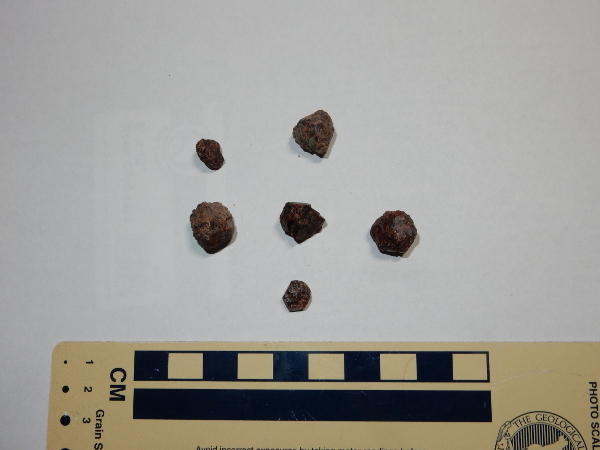 For example, manganese is nearly identical to iron in its charge and ionic radius, making it a compatible element, and it commonly substitutes for iron in iron-bearing minerals. This is why distinctive manganese minerals are not terribly common, even though manganese is a fairly abundant element. Boron, on the other hand, has a charge and radius unlike the more common elements, making it an incompatible element. It tends to concentrate in the residual magma fluids that form pegmatites, which therefore often contain tourmaline or other distinctive boron minerals. The Joseph Mine has fairly extensive tourmaline deposits, though these are of no particular commercial value. 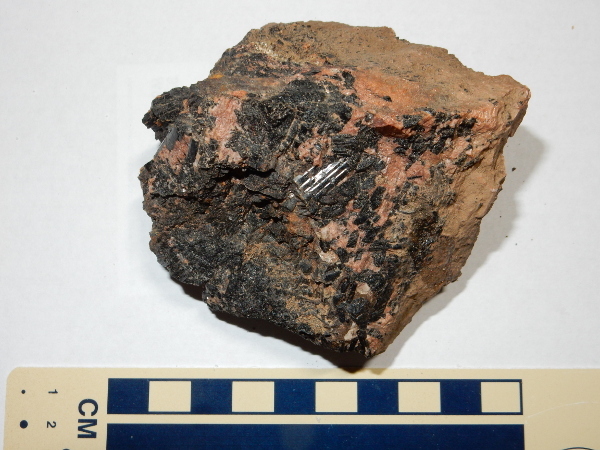 Pegmatites that intrude amphibolite often form almandine garnet, and individual garnet crystals of some size can be found weathered out of the contact between the pegmatite and the adjoining amphibolite of the Joseph Mine. Few of these are gem quality, but they can still be fun to hunt down and collect: As with fossil hunting, you have to train your eye to spot garnets mingled with the pebbles along the slopes below the amphibolite. So I got up at 5:45 Saturday morning to prepare for the trip. This is my usual waking hour during the work week, so other than missing my chance to sleep in on the weekend, it wasn’t too bad. I put together a big diabetic-friendly breakfast (kefir, high-fiber pancakes with sorbitol syrup, steel-cut oats with blueberries and ground flax seed, bacon, and eggs), let the surviving Dimwitted Dachshund outside for a few minutes then brought her back in for her morning belly rub, packed my gear, and ran off a copy of the geological map of the area. The latter took a bit longer than I expected, and the group was already pulling out of the meeting point at Sullivan Field (map) when I arrived. So I turned my car around and attached myself to the convoy. We pulled over again at the casino in Espanola (map) to rendezvous with members from Espanola and Santa Fe, and here I got my name on the tour sheet and got a look at my fellow-travelers. One was a colleague from my department at work, Neil Carlson, who I was delighted to discover actually reads this blog. So that makes four confirmed readers. So I took the hint and hitched a ride with Neil instead. Who, ironically, was probably driving the vehicle with the second-worst ground clearance in the group. But he had been down the road before, so I figured we were good. Which turned out to be the case, though there were some pretty scary patches in the road; I might have gotten through with the Wandermobile but was happy I didn’t have to try. The mine takes the form of a sizable open pit. You can see the large collection of jeeps parked east of the mine. Neil knew the area well enough to pull around to the north, giving us somewhat quicker access to the most interesting beds. We piled out and Neil pointed me towards the amphibolite beds with the best tourmaline deposits. These are located above and to the west of the main mine area. I spent a fair amount of time scouting around this knoll, and was rewarded with some fairly nice tourmaline samples. Tourmaline is a cyclosilicate mineral, whose basic framework is stacked rings of silica tetrahedra. These are joined together by triangular borate ions, while charge balance is provided by various metal ions. The type of tourmaline found at Joseph Mine is schorl, in which the metal ions are predominantly iron and sodium. The sodium and borate come from the pegmatite, while the iron comes from the amphibolite, and silica comes from both. You can see that the schorl takes the form of long black striated rods, which are particularly evident in the sample at lower right. From the amphibolite knoll, I walked down to the main mine area. Along the way I ran into some other members of the group who were looking over a pegmatite outcrop with some impressive muscovite crystals. 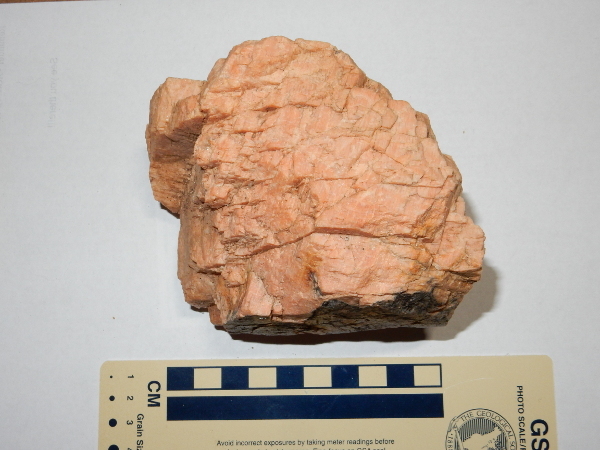 The reddish mineral is probably microcline (potassium feldspar) while the white could be either albite (sodium feldspar) or quartz. 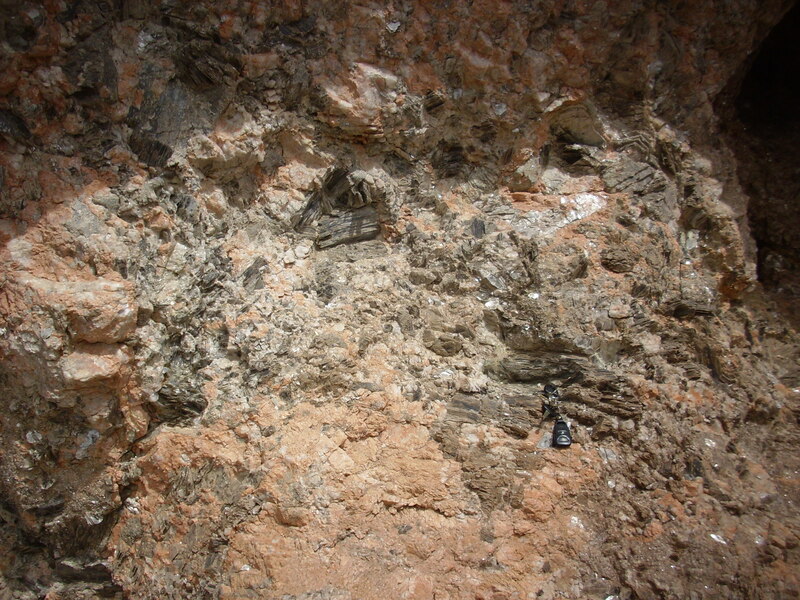 Both of the latter minerals are present in the pegmatite. The lustrous flaky mineral is the muscovite. 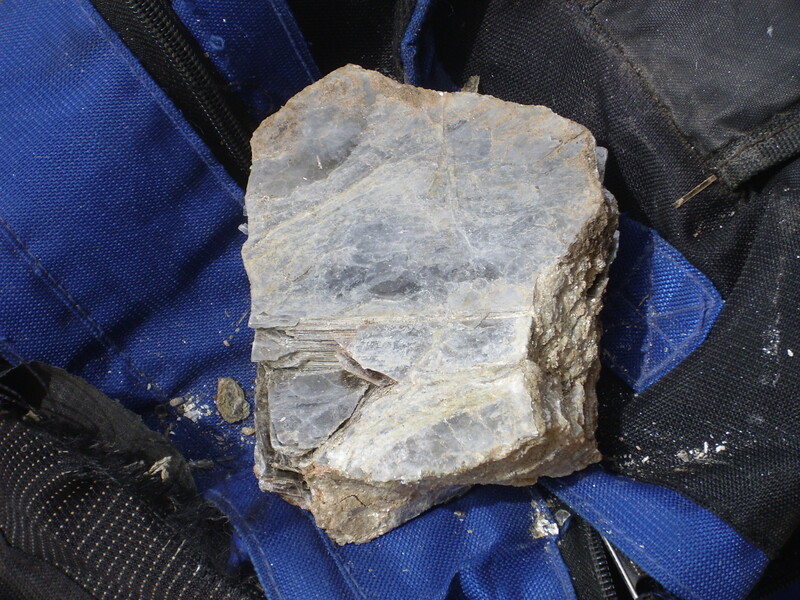 I picked up a nice sample of feldspar here. This is a cleavage fragment from a single large crystal. You can see a rough rombohedral shape, and you can hold the sample to the light and see that the entire surface reflects the light at the same angle. 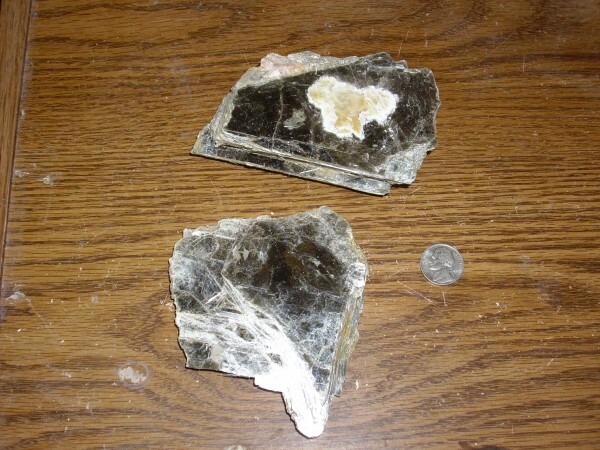 The fine striations suggest that this is either perthite, composed of thin alternating layers of albite and microcline, or pure microcline showing a characteristic pattern of twinning. My guess is that this is a fine perthite. From here I worked my way towards the main diggings, pausing along the way for a panorama. This didn’t turn out as well as some I’ve taken, but is still worth posting. Note the members of the group in the final frame, for scale. Here’s a single frame of the far side of the mine. Continuing into the main diggings, I saw some really impressive mica. Unfortunately, this fell apart before I could wrap it up. But I managed to get some other large specimens home intact. It’s not clear in this photograph, but the sample at top is nearly two inches thick. Across the quarry, some very large books of mica were oriented facing the near side of the quarry, and made an impressive sight. Time for lunch, then back to work. I was interested in trying to find some garnets before heading home. Neil had a fairly good idea where to look, in the colluvium north the amphibolite knoll west of the mine. The trick is knowing what you’re looking at. After a good twenty minutes of exploring, Neil called out that he thought he had found one; I came over, took a look, and from the crystal shape, guessed that he was right. Then I glanced down and immediately spotted another one. Well, now I knew what to look for, and found several more over the next half hour or so. Not gem quality, certainly, but still pretty cool. Neil managed to get his Subaru back down the road intact, I thanked him and loaded into the Wandermobile, and I did a little bit of scouting on the way home. There is a well-exposed tuff ring in the hills south of Ojo Caliente that seems worth visiting sometime (map) but I could not find the way to the road in the arroyo north of it. I checked Google Maps after I got home; it appears the road exists mostly on paper. It would be a long hike from the nearest public parking. Well, shucks. Got home feeling somewhat stiff, particularly in the bad left shoulder, but reasonably satisfied with my day. I have the coming Friday off, and will likely spend it hiking up Paliza Canyon in the southern Jemez. This area has some young dacite plugs, older volcaniclastic beds, and quite old (for the Jemez) Paliza Canyon and Canovas Canyon flows. Should be a fairly easy four-mile round trip along an old forest road. I’ll probably also see if the Wandermobile does any better on Borrego Mesa than Clownie did, particularly if my navigation is better. If any of my (four?) readers are interested in joining me, say so in the comments section and we’ll set a time; otherwise, I’m going to head out whenever I get done sleeping in. Great Blog! I may haul the family up to the mine! Phil, how young is your family? There was a youngster maybe ten years old on this trip, happy as a clam as he hammered away at books of mica. Could be a real nice family trip if you have a suitable vehicle. And, if not, it’s just a 2.5 mile hike in from the resort trailhead.